It's that time of the year again, when the rains subside and the clouds open up to those marvellous night skies. Which means that camping trip you’ve been itching to take is just around the corner. Of course, you’ve also been meaning to buy the required gear too. Don’t worry, whether you’re a complete beginner or a vet looking to cover your bases, we’ve got you covered. What you should take on your camping trip depends on what type of trip you have in mind. Driving somewhere and going on small day hikes from a populated base camp? You can bring a nice, big stove. Hiking 30 kms in Kodachadri? You may want something a little more portable. The distinction between the two is usually labeled as “camping” or “backpacking.” Campers drive somewhere and camp out of that location. Backpackers hike in and then make camp with what they’ve brought. 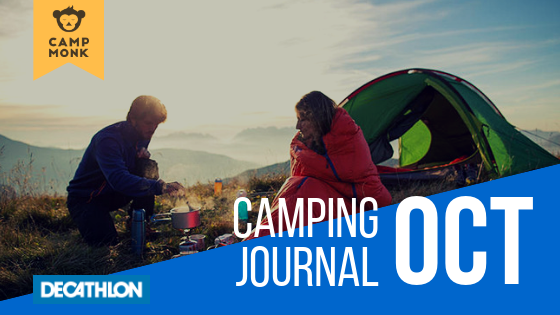 We've hooked up with Decathlon India to make a list of 10 things to ought to carry on your next camping trip.. go on, give it a look.